When I'm eating a piece of meat, be it chicken, steak, or what have you, I never want to see actual fat. I hate it. I've always been repulsed by the sight of real animal fat. I'll cut it off, I'll feed it to the dogs, or I'll just leave the fatty portions on my plate. Likewise, I've never liked things coated with grease or lard. If there's excess mayo on a sandwich, I'll scrape most of it off. I'm the weirdo that uses two or three napkins to sop grease from the top of a piece of pizza. Other people see me doing it and they say, "Why are you doing that? The grease is where all the flavor comes from!" Maybe so. But I prefer it without the excess grease. However, all that being said, I must point out that when fat is seamlessly blended into a product, be it a doughnut, milkshake, cookie, or delicious chicken salad, I eat it up like it's going out of style. And not only that, but I'm usually actually turned off by lower-fat, lighter options of the same products. This chicken salad is no exception. It's not really terrible, though. In fact, Sonia loved it. But I'm going to immediately compare it to the two best chicken salads I've ever had, Wine Country and Curried White Chicken Deli Salad, and find it wanting. The only ingredients that are comparable between this and the wine country salad are the white meat chicken pieces and the celery bits. 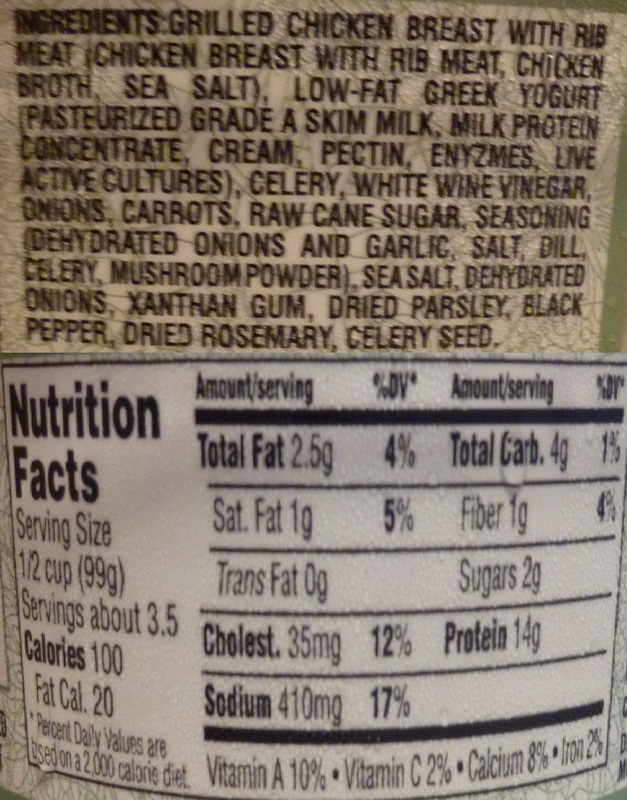 I'm not sure how, but I feel like even the celery flavor is more enjoyable in the wine country option. The carrot bits in this dish add some pleasant crunchiness—but very little in terms of flavor. 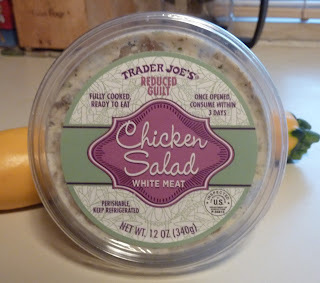 I must admit, though, that the chicken in this reduced guilt salad was good white meat, and it was relatively moist and had a nice texture. Furthermore, in this product's defense, the difference in fat content is astounding. We're looking at 2.5 grams of fat per 99 gram serving here, whereas the wine country salad has 11 grams per 113 gram serving. That's something like 1/4 the amount of fat, plus there's less than half the calories. This isn't one of those situations where TJ's cleverly changed the container size and serving size by a third and then boasted "33% less fat!" There's a marked difference here. The problem is you can taste it. Or rather, that you can't taste it. I think it's bland. A bit of mustard certainly does this product a service. The chicken is okay as I mentioned before, but in the end, I think I'd rather just buy my own lean chicken breast, some lettuce, and some Miracle Whip and make my own low-fat chicken sandwich—and at $4.49 for a small tub of this stuff, you could probably assemble those three ingredients for less money. Sonia gives this product four stars and says that it's a great, healthy alternative if you don't want all the fat and calories in the wine country chicken salad (which she insists on calling "Sonoma Country Chicken Salad." She's so cute). I think it's worthy of three stars—not exactly a treat, but it's amazing they cut such a drastic amount of fat and calories and still yielded something that's even edible. Gimmicky name or not, that stuff is GOOD! 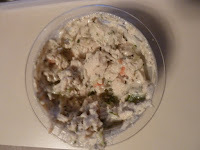 I'll stick with the Curry Chicken Salad. It is THE BEST!! Not gonna argue with you there. I purchased a tub of the reduced guilt Chicken Salad last week and I threw it out after tasting it. My wife tried it and she wanted no part of it either. She suggested I try doctoring it up somehow but the after taste was just too strong. 5 bucks down the drain. All of our TJ purchases were very good. That's extremely foolish to throw it away. TJ's would have given you a full refund, no questions asked. This stuff was so disgusting!! Full of all the wrong things: dried garlic, dried mushroom. ICK. 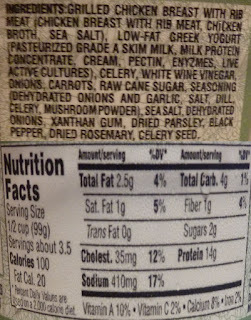 Why not craisins, apple, celery, tarragon -- normal things that aren't fattening that have flavor?! ?